Yes, I do tend to forget a lot these days. And mind you, I am not really that OLD when you can start associating forgetfulness with age. 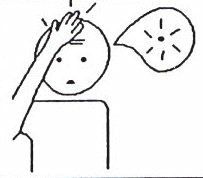 Let me tell you a few of my forgetfulness episodes and do tell me if you have faced similar situations. The other day I came home and switched on my bedroom light and realized that the bulb has fused. I made a mental note to go downstairs and buy one immediately (We live in an area where the supermarkets are just walking distance). Then I went to the living room, read a book for a while and then headed to the kitchen. I was so engrossed in cooking that I forgot all about the bulb. It was only when DH came home (quite late), I realized I had forgotten about the bulb. Anyway, I thought I would buy one first thing in the morning. That didn't happen. The day passed and towards the evening, I went to the supermarket ONLY to buy the BULB. I browsed stuff, checked what is on offer and bought a number of things. I came back home and when I entered the bedroom, I realized I didn't buy the BULB but had bought a number of things I didn't need immediately. Yeah! that's me! I went to buy something but came back with a set of things but NOT the thing I went for in first place. Needless to say, I went again to buy THAT bulb and I made a point to make a list of things to buy on paper before heading out to the store. Well, these episodes didn't end here. One fine day, the bulb in my kitchen gave away. I don't know what it is with bulbs in my house these days. But, this time I made a list of things to buy and jotted them in my little diary. I went to the supermarket and bought things, but I FORGOT to check my diary and came back without the BULB. Now that is heights of forgetfulness! Well, the bulb episodes, for now, have ended here as no other BULB has given away after that. 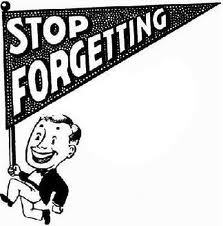 But, my forgetfulness episodes doesn't end here. I keep forgetting what DH asks me to do every now and then. And of course, he accuses me, that I forget things he asks me to do but not the ones I want to do, like reading a book. Sometimes back, he asked me to fill in a bank slip for rent payment. He had been very busy with his office work at that time and so I was more than happy to do my bit, to help him manage time. I usually keep a some extra bank slips at home, but that day I couldn't find where I had kept them. I decided I would pick one from the bank on my way to work (I work voluntarily for a charity) and since the day was bright and sunny, I decided not to take a bus, but to have a nice walk to my workplace. The day was bright and the air was cool and I was happy because of the nice weather. I loved the soothing breeze and walked briskly towards my destination. I walked past the church, the canal, the BANK, grafton street and reached my workplace well in time. The day passed and it was by 3.30 in the afternoon, I realized I didn't take the slip from the bank. I promptly called it a day and headed for the bank. On the way, I remembered that I didn't have fresh coriander at home and decided to buy it from the Desi shop opposite the bank, after picking up the slip. The banks here on particular days closes as early as 4 pm, so, I had to hurry. Well, I reached in time, just 5 minutes before the closing time and did my little work. Relief washed over me and happily I headed for home. Only when I reached home, I realized I didn't stop by the Desi shop. I have a crazy habit of adding coriander leaves to everything I cook. I cringed at the thought of heading out again and almost shouted - Stop Forgetting, but not with a happy face as below! For all who would advise me to have almonds in the morning, I must tell you, I have already started! I remember things , especially facts and figures but totally forget names, have real difficulty in remembering them.